Experimental performance tuning for VM suspend and resume - In this Technology Preview release, you can enable an experimental performance tuning specifically improve the VM suspend and resume time consumption. To enable the feature, add the following lines to the VMX and ensure the VM is set to Hardware Version 11. 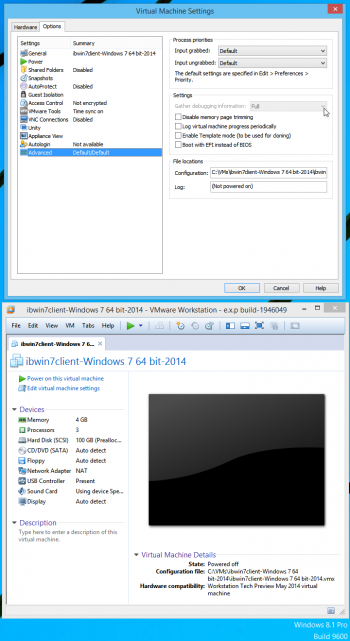 This performance improvement applies to both encrypted VM and non-encrypted VM. In our in-house testing, suspend and resume are improved up to 20% and 60% respectively. We highly recommend you to try this feature and leave your feedback. I have a 64 bit Windows 7 VM I regularly use on my laptop. Even though I have 4GB allocated to that VM, resuming from suspend usually took only about 10 seconds, under VMware Workstation 10.0.3. It's a preallocated, encrypted C: drive in that VM, hosted on my 64 bit Windows 8.1 laptop. Not bad. I also have a full daily backups of this laptop. So rolling back is always a simple network boot away, restoring from my Windows Server 2012 R2 Essentials VM that's always left running on my ESXi 5.5 vZilla host.. This gives me a certain fearlessness about trying out beta code, such as this preview that's destined to soon become VMware Workstation 11. Why do I run a VM locally, when I have an 5.5 ESXi host on my same gigabit network? Because Windows 7 Professional doesn't support multiple monitors in a remote desktop session, and I really want to take advantage of my three external monitors. and quickly discovered that the same VM was now rather slow. All VMs were rather slow. Not just resuming, but using them. Stuttering sound, sluggish mouse, slow to switch to multiple monitors. Tried upgrading VMware Tools, rebooted, then upgraded the virtual hardware to the new version 11. Didn't seem to make a difference. So I quickly found myself seeking a way to disable the default debug mode that this preview arrives with. Yes, debug is useful for bug reports, so you don't want to do this if you're submitting bug reports and uploading support bundles. That's why it's enabled by default, and the per-VM settings are grayed out, when looking at a VM's Advanced settings, seen above right. I began to experiment a bit. Turns out disabling debug mode globally was rather straight-forward, seen in the very short video (and described) below. See for yourself! The results were a rather pleasant surprise. And I didn't even do the tweak yet, for faster VM suspend and resume (described by VMware at the top of this article). I'm assuming you have a backup of your complete system, and a backup your C:\Program Files (x86)\VMware\VMware Workstation directory. Proceed at your own risk! 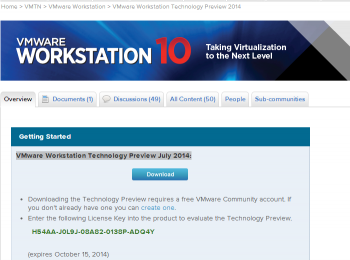 As with the prior Technology Preview May 2014, please post all of your feedback in the VMware Workstation Technology Preview 2014 community forum. Our Developers, Quality Assurance Engineers, Support Teams, Technical Writers, Product Marketing and Product Managers are all actively involved in the forums to ensure that your suggestions and comments get our attention. Remember, if you find yourself being asked to upload your log files, you're going to want to make sure debug is re-enabled first, before collecting your log files. How? See this webpage for more details of the vSphere Beta Program. I had a Windows 7 VM crash on me (stable for weeks, this was first error I've had, seen below. I have no snapshots for this VM. Looking into the last few dozen lines of the vmware.log file the error referred to didn't shed any additional light on the error. It's just a beta, and I have the VM backed up. So I simply deleted the 2 .lck files, then was immediately able to start the VM right back up again just fine.